For those of you who live in the area, of course, it will only be a matter of driving a short distance. But for those of you coming in from out of town, we will try to offer as many suggestions as possible. First, if you haven't been home for a while, and if you have the time, we urge you to come in a few days early and explore the area. Much has changed, even since our last reunion. Some of our favorite recreations are gone, of course, but there are also new things to do which were never here before. We have a world class ice rink, an outstanding miniature golf course, a dozen really nice restaurants, and a movieplex. If you've never visited the hilltop K-12 school with its swimming pool and other features, it would be worth a stop. Robinson Town Centre contains every store imaginable from bookstores to clothing boutiques to wilderness outfitters. 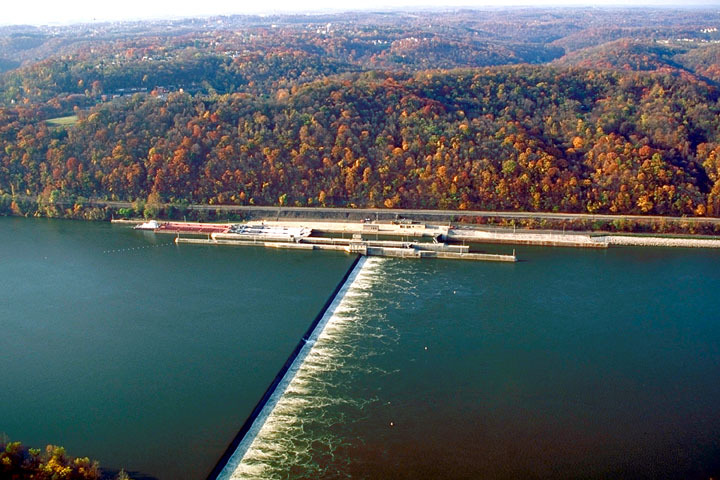 The Pirate Stadium is considered the most beautiful and state of the art park in the majors, and the old Buhl Planetarium is now the Pittsburgh Science Center, with a magnificent riverfront facility including an OmniVision theatre. Kennywood Park is still there, with a brand new 2010 hyper roller coaster. All considered, it's still a pretty good place. Friday night, our festivities will begin with an informal get together at Mario's Restaurant, 935 Beaver Grade Road, Moon Township. To get there, drive out of Coraopolis toward Sewickley but turn left up the hill onto Thorn Run Road, as if you're going to Mooncrest. Continue on out the road for several miles, then turn right on Beaver Grade Road. Mario's will be about a mile on your right. If you're staying at the Suites, drive out to the entrance and turn left onto Beaver Grade Road. Pass the Coraopolis Heights Road and Thorn Run Road intersections and look for Mario's about a mile on the right. 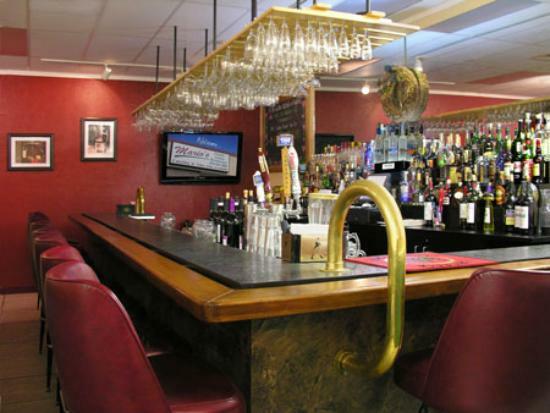 Mario's will provide a Cash Bar and Appetizers : Zuchini, Stuffed Mushrooms, Calimari, Roast Red Peppers, Mixed Cheeses, Assoeted Meats, Veggies & Dips, and Eggplant Parmigiana. The reunion committee will provide table settings, ice and the usual entertainment of Master of Ceremonies Bill and Commentator Lucy. We'll be at Mario's from 6:30 - 10:30. The main event Saturday night will also be at Mario's. This will be a Buffet Dinner with a Cash Bar, shown at right. Mario's is an upscale family style Italian restaurant. It serves fine cuisine at reasonable prices. The menu includes traditional Italian dishes with special focus on Chicken and Seafood offerings. 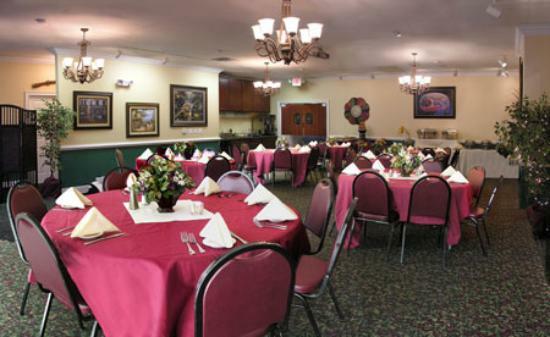 The dining area is spacious, as seen by the photo above. Mario's has a good wine list, including excellent Italian and American varieties, and serves the full range of mixed drinks. The bar will open at 6:00. The Class Group Photo will be posed at 6:45. For $13 you'll receive a copy in the mail a week later. The dinner buffet linje will open at 7:30. Several of the entrees Mario's is famous for will be available : Chicken Primavera, Chicken Cacciatore, Dessert choices will include Tira Misu, Limoncello and Cheesecake. For those coming in from out of town, we have made group arrangements at the Embassy Suites, 550 Cherrington Parkway, in Moon Township. The special rate is $129 until Sept. 12. Identify yourself as a member of the Coraopolis Class of 1960. Breakfast is included. From Coraopolis continue on Coraopolis Heights Road, cross Beaver Grade Road (when we were in school there was a blinking yellow light here) and continue toward the Parkway West. Just before the parkway Cherrington Parkway will turn left, and Embassy Suites will be at the top of the ridge. This hotel sits on what used to be the old Montour Heights Country Club. At the 50th Reunion in 2010, classmates said their meals and meetings in the Embassy Suites lobby were as much a part of the reunion as the Friday/ Saturday night events. 412-269-9070 or 800-362-2779. Lincoln School classmates will get together for lunch on Saturday at the Bridges 446 Restaurant at the Embassy Suites. 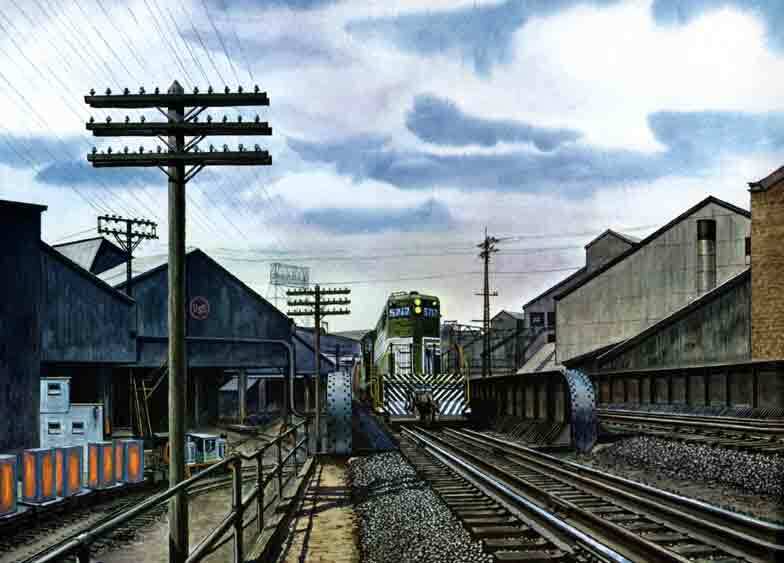 We'll eat and talk from noon until around 1 p.m., then drive over to the old Lincoln neighborhood for a tour of the Cinder Steps, the Vine and George Street sledriding runs, the old stores (all of which are still standing but as converted residences), Cliff Street, the old Montour Railroad (which is now a biking trail), Pumphouse Woods, Omlors Woods, Braun's Barn, and as many former homes of classmates as possible (none of our classmates still live at their old homes but the houses are still there). While we're in town, we'll also include the old YMCA (now apartments), Fifth Avenue, the old passenger stations, the Junior High and High Schools (now apartments), and the Stadium (now the site of the high school; the stadium was rebuilt down below). Hyeholde is still the number one rated restaurant in Pennsylvania and listed among the nation's top 21 by Gourmet Magazine. If you're going to eat at one additional restaurant while you're in town, this should be it, for the Medieval ambience and the French influenced cuisine. Barbara McKenna, daughter of the couple who ran it while we were in school, still owns and runs it. Chef Chris O'Brien offers a fireworks display of food : Stuffed Quail, Grilled Boar, Turnips Chestnut Verjus, Grilled Moon Township Mushrooms, Elk, Lamb, and Pennsylvania Rainbow Trout with Roast Squash in Sunflower Sauce. The Seasonal Soup is tempting but resist it and take the standard Sherry Bisque. Of the Salads, we recommend the Red Oak Lettuce in Vodka Dressing. 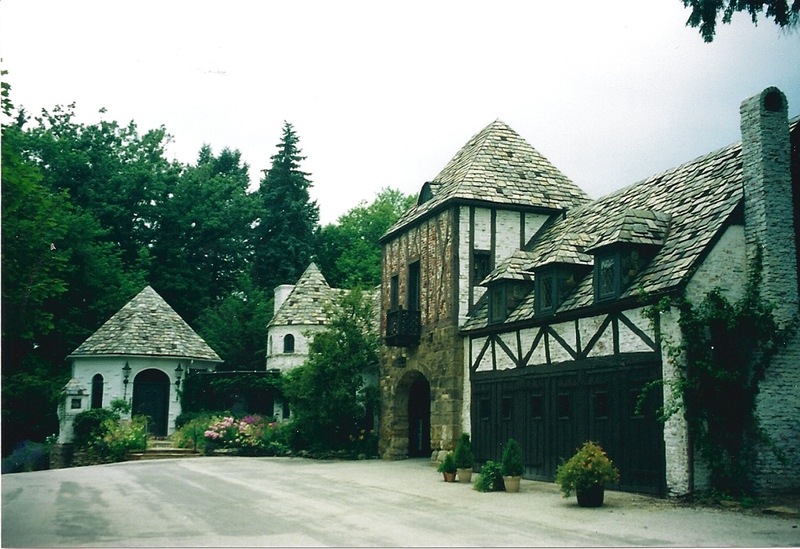 Heavy overhead beams, stained glass windows, slate floors and tapestried walls give Hyeholde a distinct Saxony feel. Their wine list tilts French but is exquisite within that framework. Let your waiter select your wine for you; they know these wines better than you do. 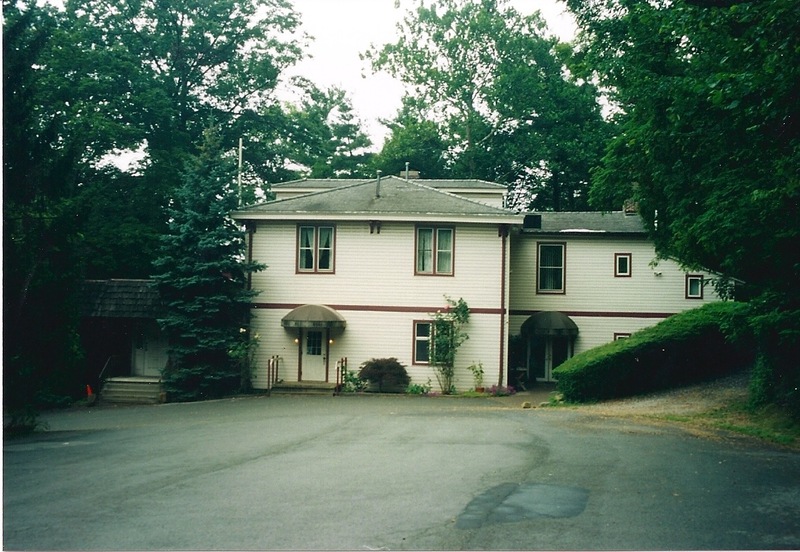 Hyeholde is on Coraopolis Heights Road beyond the country club on your right just before Beaver Grade Road. Bring your camera. 264-3116. Reservations are prudent. If you want a culinary adventure, you need to meet Alex Jozsa Bodnar. Alex was born and raised in Hungary and became a Freedom Fighter during the Soviet Invasion. Trapped, he escaped across a minefield into Austria, then to England and on to America. After a corporate career, he bought an 1880 hotel & tavern building in the Hazelwood section of Pittsburgh to save it as the entire neighborhood was being demolished. He converted the top floor to his own residence, three middle floors into facilities for making sausage, bread and pasta, and the ground floor into a restaurant. One unlike any you've seen. Most of the ground floor is the kitchen. There's a small lobby and a small dining room with two long tables. Alex serves one party at a time by appointment only (412-422-1886). You are as a guest in his home. With dinner you get his conversation. 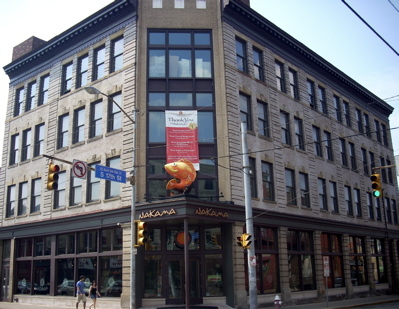 Alex has also built Jozsa's Corner into the Pittsburgh Center for Hungarian Culture and Resources, which extends to music, dance, folklore, art and history. But Hazlewood has been a neighborhood in decline for decades, and when Alex moved in, his lone building amid blocks of rubble and vacant lots became a target of an urban gang. After several nights of broken windows, gunfire and calls to the police going ignored, he opened his trunk of Hungarian Freedom Fighter equipment and propped himself in a lawn chair on the sidewalk at dusk. When the gang moved in, Alex opened fire with his Soviet machine gun. They carried several gang members off, but he hasn't been bothered once in the 20 years since. 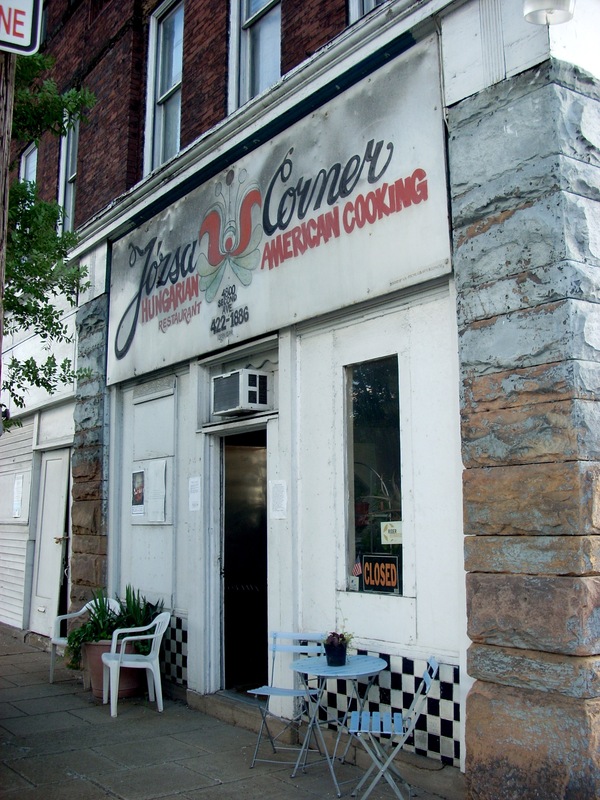 Jozsa's Corner is at Hazlewood and Second Avenues, the only building standing on the 4800 block. 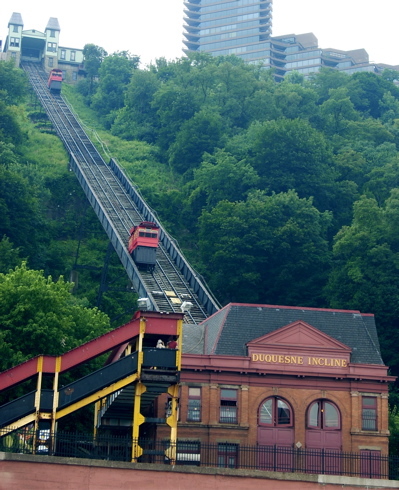 From Coraopolis, drive up Neville and McKees Rocks, cross the Fort Pitt Bridge and follow I-379 (Parkway East) to the Homestead/Squirrel Hill Exit. Take Beechwood Avenue up the hill, turn right on Hazlewood, go to the top of the hill and down the other side to the restaurant on your left along the railroad tracks. Jozsa's has no menu. You eat what Alex fixes. You need four for a reservation, and you'll pay about $20 each. But it will be a feast, and the food is wonderful. Every item is made from scratch on site that day. You start with Langos, a fire bread made from special dough, quick dipped in hot oil until crispy golden brown, topped with garlic salt, spices and grated cheese. With it comes a tray of cheese and various vegetable sticks. Soup includes fresh vegetables and beef, chicken, or pork. Salad usually includes Marinated Red Cabbage and Onions. The Warmup Entree is Noodles & Mushrooms, a delicious concoction which in any other restaurant would be an award winner. The two main courses are usually Transylvania Gulyas (Goulash) and Chicken Paprikas. The Gulyas is the star of the show. There's not an item on a menu anywhere on America which beats Alex's Gulyas. His Sauerkraut is milder and sweeter than the German version and the pork is slow cooked all day until it falls apart in your mouth. The noodles in the Paprikas are superb, made upstairs just that afternoon. There's Braided Bread; refills on any bowl you empty, and dessert chosen from Nut Rolls, Apricot Rolls, Kiflis or Palacsinta. Alex does not have a liquor license so you need to bring a bottle of your favorite wine. With only one party at a time and him being the only employee, dishwashing is a problem. To solve it, he serves on paper plates. So you get food fit for a king served picnic style. Jozsa's Corner is cash only. If you're into ethnic cuisine, this eccentric little place is an absolute must. Remember when the Sewickley Theatre was the classiest movie house this side of Pittsburgh? When we were in high school a big time date was dinner at The Sewickley Hotel and a walk two blocks down to the movie. A nice Saturday night could also be a movie and a stop by the Hotel afterward for shake, fries and burger before the drive back across the bridge home. 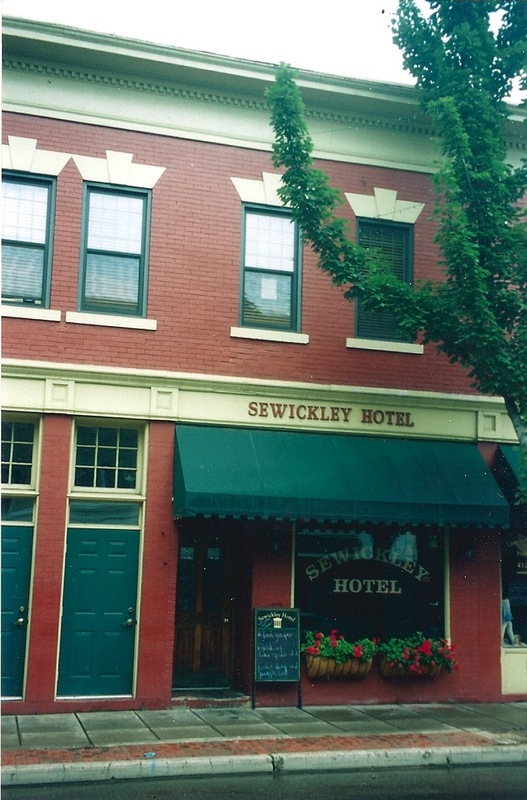 The theatre is long gone, but the Hotel is still the gathering place for the real and wannabe gentry of the Sewickley area. Not one piece of furniture has changed. It still has that long polished bar and all the tables and booths, with the lighting still low for that sort of romantic mood. The menu, once you move past the basic milkshake, fries and cheeseburger, is still nicely upscale. You have to put up with the usual pretentiousness ("Our velvety mousse truffle pate includes black olives, cornichons and crostini garnish") but that has always been part of the fun, kind of like stepping onto the set of The Great Gatsby. The House Salad is a cranberry-gorgonzola-orange creation much appreciated by the local Volvo set. They STILL serve that Turtle Soup and it's STILL the best in this area. It used to be second only to the version served at Riders On The Bay on the Erie waterfront, so with Riders now closed it is quite possible this is the best Turtle Soup in the whole state. The Seared Sea Trout is currently the big hit. It comes crusted with pecans in an orange basil cream. Then there's the Grilled Cobia, seasoned South Carolina style ("on the mellow side of lively") in a Squash and Sun Dried Tomato Chutney. It's not unanimous, but about half the restaurant goers in the area think the Hotel offers the best Crab Cakes and Steaks in Western Allegheny County. Save room for dessert, because in another blast from the past, they STILL serve that great Coconut Creme Pie that girls always ordered after a movie. In one more bow to the 1950s, they still include all the cute spelling mistakes on the menu. So you have Caesar Saddle, Scared Sea Trout, Grilled Cobra, and other malapropisms to try and decipher before you can place your order. But at only a few minutes from downtown Cory, it's definitely worth a visit. They're open from 11 to 3, so you could go for lunch Friday or Saturday. Or you could have dinner from 5 - 10 on Thursday or Sunday. On Beaver Street. Coming off the bridge, go straight downtown and turn right. It's on your left. The Speakeasy is patterned after the speakeasies of the Al Capone era. This theme is maintained by the off in the woods location and barely noticeable driveway. Look for it just outside of Sewickley heading toward Pittsburgh at 17 Ohio River Boulevard. The driveway cuts sharply uphill. Except you can't turn left. So your better approach would be to cross the Island on I-79, go West along the river, and watch carefully for the driveway, announced by the Jazz Age billboard. Once there you'll love the brick walls, Jazz Age decor, sheet music display, and picture windows looking down on the river through a break in the trees. Once past the ambience, this is a very good restaurant. Of the appetizers we like the Frog Legs, Crabmeat Hoelzel and Fried Zucchini in Marinara Sauce. You MUST try the Three Cheese Five Onion Soup. No where else has it and it's great. Of the entrees, they offer 10 seafood items, 14 steak, veal and chop items, and eight classics. Of these, we like the Orange Glaze Duck, Pecan Breaded Lamb in Bourbon, Scallops and Spot, both broiled in a sauce beurra blanc. Spot is too rarely offered in restaurants. It's delicious and The Speakeasy prepares it very, very well. The wine list is not extensive but contains some outstanding mostly American choices. Bahama Breeze is a Caribbean restaurant with decor and music to match and a loyal following in the Western Hills area. Of their appetizers, we like the Crab Claws, Roast Cuban Bread, and Fire Roasted Jerked Shrimp. The Bahama Seafood Chowder and Cuban Black Bean Soup are both excellent. Among the entrees, we think their Paella is their finest creation. It's a heaping skillet of assorted seafood, chicken, sausage and vegetables on a bed of yellow rice. We've eaten this all over the U.S. and the Caribbean and this is a very good interpretation. However, the Calypso Shrimp Linguine, Salmon Pasta (in passion fruit sauce with spinach, basil, tomato and mushrooms), Chicken Santiago and Chicken Kebabs are definitely worth the drive to Robinson Centre. 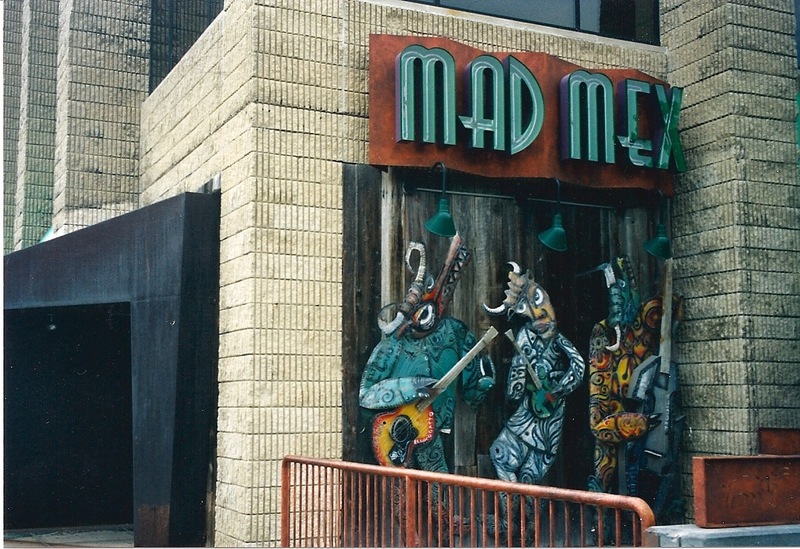 Mad Mex is Mexican food on steroids. The atmosphere is pretty zany, and the menu features some of the more creative Mexican dishes you've ever imagined. They're not too concerned with Authentic. This is entertainment. But beyond the carnival theming, this may be the best Mexican restaurant in Pittsburgh. It starts with the traditional salsa. You get to pick your three. We're pretty impressed with the Avocado Tomatillo, Fire Roasted Tomato Chipotle and Pico de Gallo, but if you like heat, you'll want the Pineapple Habanero. They have great soups : Red Bean Turkey Chili, Black Bean, Chickpea Chili and Tortilla. There are five salads and 13 Burritos, of which we like the Veggie (pico de gallo, roast corn, zucchini, portabellos, grilled peppers and onions). If you're an Enchilada fan, try the Red Velvet (grilled chicken, spinach, pico de gallo, zucchini, cheese, red and green sauces on a corn tortilla). They take great pride in their $10 Chicken Chimichanga (marinated chicken, peppers, mushrooms, onions, Monterey Jack, red pepper sauce, rice, and black beans, all sealed in a corn tortilla and fried). Our Quesadilla expert high fives their concoction of black beans, pineapple, cheese and grilled steak. Across the parking lot from the Robinson Town Centre Movieplex. 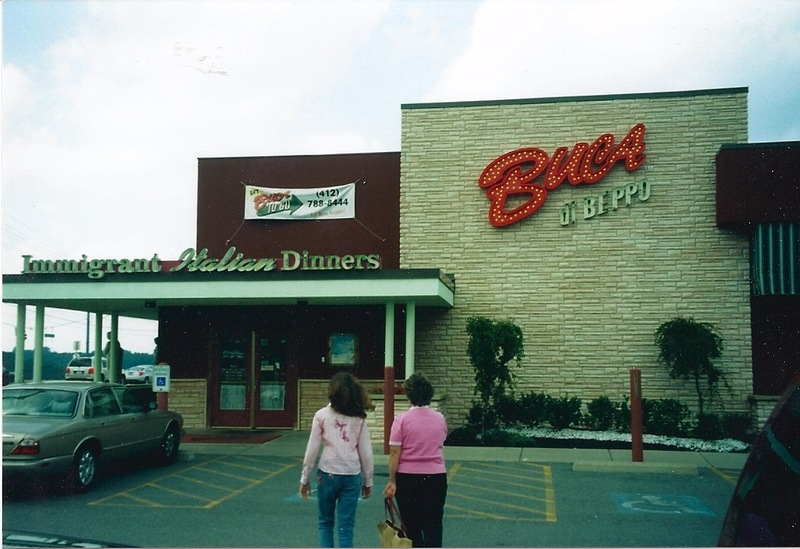 Buca di Beppo markets itself as Immigrant Italian. The walls are heavy with photos of Italian American families in New York, Boston, and Pittsburgh, celebrating weddings, baptisms, and other occasions. Meals are served family style in two sizes : small (for two or three) and large (for five or six). In addition to the usual booths and tables, there are The Pope's Room, and The Kitchen. You can sit around a large table with a statue of the Pope in the middle and Vatican photos all around, or you can sit in the kitchen and eat while all around you the staff prepares the meals. The food here is not as good as the Italian mothers in Coraopolis used to make. It is, however, pretty good. We're particularly impressed with their Ravioli, Canneloni, Manicotti, Rigatoni, and Eggplant Parmigiana. If you want adventure, their menu is more extensive than other Pittsburgh Italian restaurants, and some items are quite creative. Keep in mind, however, that you cannot have each person order something different. You need two or three people to agree on one bowl of whatever. Several outstanding Italian wines, especially the Tuscany Chianti and Montepulciano d'Abruzzo Citra. The dessert list should be illegal. Try to save room. Robinson Town Centre, left at the T then right. Many of you were still around when Pittsburgh tore down Forbes Field and the Steelers and Pirates moved to Three Rivers Stadium on the North Side. But more recently, Three Rivers was demolished and each team has moved into its own stadium, custom made for its own sport. While you're here, you might consider taking in a Pirate game in their new PNC Park. 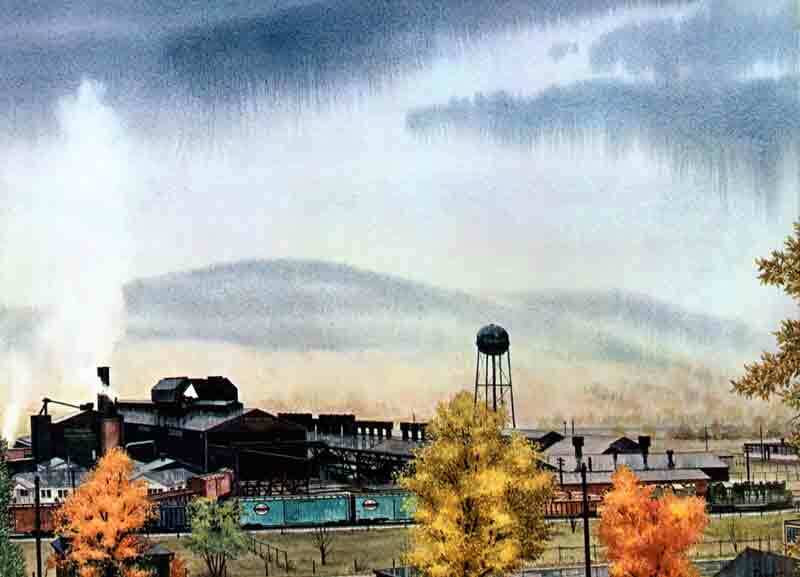 The team has been struggling lately, which just seems like old times to us who grew up in the 1950s. But the stadium is beautiful. It was a conscious attempt to recapture the flavor of old Forbes Field with a modern flair. It's a small park, with close in seats, and the outfield is open, framing a view of downtown Pittsburgh. The stadium is right on the riverfront; from higher seats you're looking down on the river beyond Center Field. If you take in a Pirate game, while you're on the Northside, you should go early (for a night game) or stay late (after an afternoon game) and eat at Max's Allegheny Tavern. It's on Suissmon Street, a long walk or short drive from the stadium. (Find East Ohio Street, follow it toward Etna, turn left on Middle Street, and left on Suissmon.) 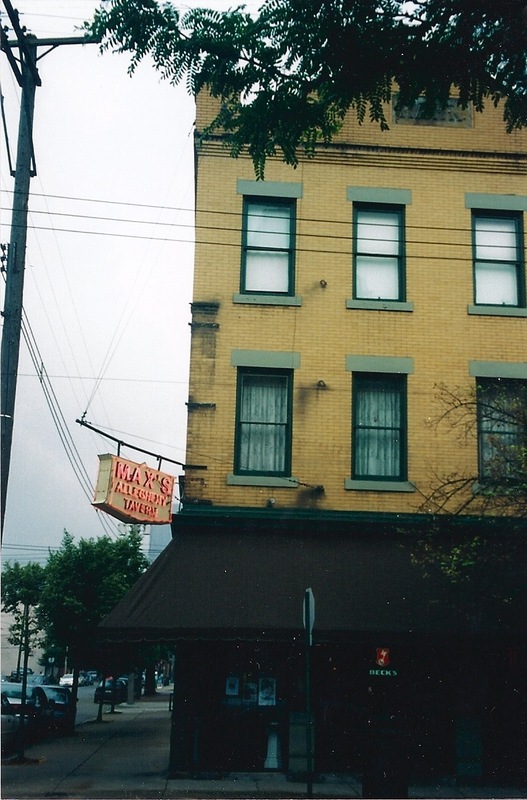 Max's is a treasure that goes back not only to the 1950s, but all the way back to before Allegheny was part of Pittsburgh. Max's doesn't look too impressive from the outside---this is the original 1800s location---but inside the place is a wonderland of polished wood. The bar is the most impressive in Pittsburgh. The solid oak icebox has been keeping fine German beers cold since 1891. The cast iron stove and brass and stained glass chandaliers trace back to when this neighborhood was called Dutchtown. This was actually the original Max & Erma's. The national chain took the name, became famous, then sued this restaurant to make them remove the Erma's. They did, but kept the authentic German food. There are sausages, schnitzels, cabbages, spatzle, dumplings, sauerkrauts, potato pancakes, . If you go, at least one of your party MUST order the Hasenpfeffer (braised rabbit in spicy pepper sauce) and somebody else has to order the Ghoulash. The German Potato Side has the great mustard bite you expect. Don't overdo it, because you have to leave room for dessert, and don't be distracted by the others. There's only one : The Strudel. As a matter of fact, it would be worth stopping in after a game just for the Strudel. Max's offers some very good German wines, but of course the pride and joy of any good German restaurant is its beers. Max's has an impressive array of German beers. Our beer conneisseur, who runs the American Beer Museum, says the dark varieties are Max's best. Mallorca's is the second best Spanish / Portugese restaurant we've found in America, surpassed only by the Lobster Pot in Provincetown out on Cape Cod. But no wonder : the owner and chef are from Portugal and the manager from Spain. 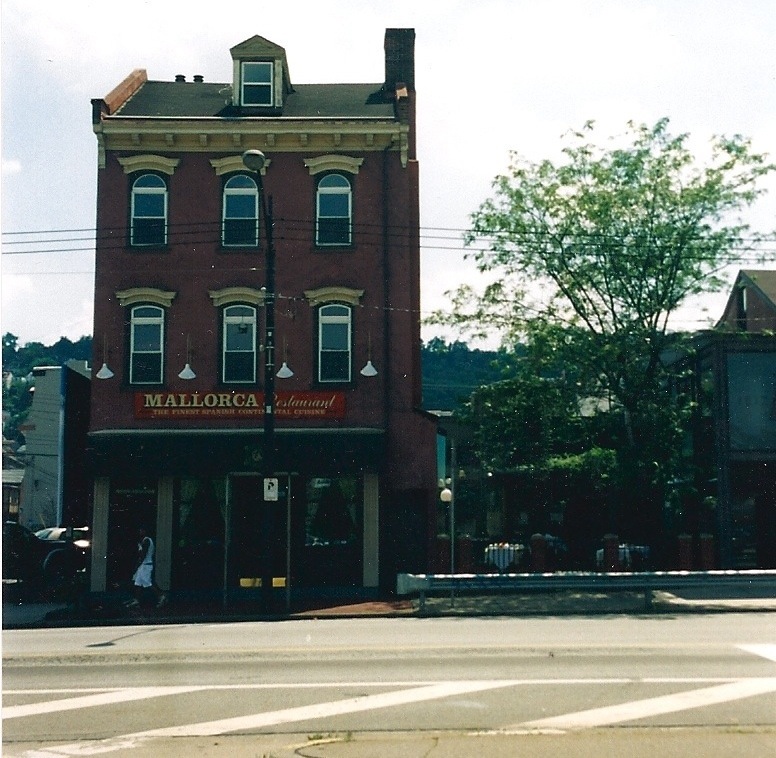 Mallorca's is on Carson Street, a red brick building on your right across from the Birmingham Bridge, half a block past South 22nd Street, as you drive toward Kennywood from Station Square. It's been here since 1992. You can eat either inside or out in the courtyard (to the right in the photo at left). Mallorca's has great soups, salads, desserts, fish items and wines, but what they're famous for is their Paella, the national dish of Spain, a saffron seasoned mix of seafood and rice. Our favorite version, Paella Velencia, mixes seafood, chicken and Spanish sausage. When it's available, the Flounder is great. Since you'll be here in hot, himid, July, you might try the cold vegetable gazpacho soup. Portions are huge and the food is delicious. They use only olive oil --- no butter. If you're just not a seafood fan, they have excellent veal, chicken and prime rib dishes. Wine Spectator Magazine in 2003 gave Mallorca's its Award of Excellence for its collection of 300 kinds of wine, mostly Spanish, Portugese and French. Mitchell's Seafood is on The Waterfront. 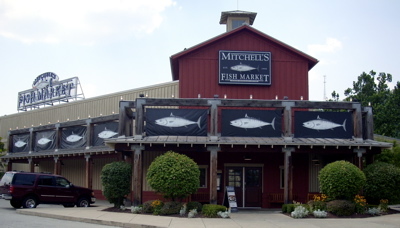 Mitchell's does a great job with the different seafood items considering its location 500 miles from the nearest saltwater. They do it by flying everything in fresh everyday from the Chesapeake, Cape Cod, and the Gulf. The menu changes daily, reflecting what's available. If they have the seafood gumbo, order a cup for an appetizer. If the Georges Bank Scallops or Blue Crab are in, take one of them for your main course.They fix the scallops with spinach, mushrooms, potatoes and sea salt, and the crab with a simple alfredo sauce. If those are unavailable, try the Chilean Sea Bass or Yellowfin Tuna with stir fry vegetables. Prices of any of these will be somewhere in the teens. Or you might try one of their platters, which run about $20-23, but would be plenty for two. We especially like the Combo Platter, which includes shrimp, scallops, cod, fries, hush puppies and coleslaw. We spend a lot of time on the coast, and eat at a lot of seafood restaurants, and this is one of the best. The atmosphere is quiet and relaxing after a hard day at Kennywood : polished wood, soft red leather, glass, and, if you prefer, the patio overlooking the river with plenty of trees. The wine list leans heavily toward whites. A lunch stop might include a bowl of chowder or bisque, a salad, and an $8 order of pan roasted wild blue mussels with white wine, garlic and tomatoes. Bravo Italian Kitchen (Waterfront) is a 21st Century updating of Northern Italian cooking. Kids love the Wood Grilled Chicken Pizza with seared peppers, basil, tomatoes, mozzarella and feta cheese. If you're into Lasagna, Mama's Lasagna Bolognese has three thick layers and drowns in meat sauce. The best entree is Twin Filets Scampi, topped with shrimp, asparagus, mashed potatoes and scampi butter. Among salads, we like Insalata Mista, a pile of field greens, bacon, tomatoes, gorgonzo and balsam. The Caesar dressing is better than the house Italian. The Italian wine list is excellent. Owners call this "white table casual," $12 - 20 per person. TGI Friday's (Waterfront) is open for lunch and dinner.If you're up for steak after all day at the park, they offer a New York Strip, Flat Iron and Classic and Petite Sirloin. The Baby Back Ribs are pretty good, but if you like ribs, we suggest the Jack Daniels Glazed Ribs. As a matter of fact, we think their Jack Daniels Grill is their best offering. You can order Chicken, Shrimp, Steak, or Chicken all glazed with Jack Daniels then grilled. Adults might appreciate the array of Margaritas available, since nowhere in Kennywood are alcoholic beverages sold. TGIF's also has good coffee. There are five kinds of chicken, of which we like the Peruvian Herb Roasted Chicken and Dragonfire Chicken. Six salads help balance all those Potato Patch Fries. If you never tried a Slider, this would be a good place to start. There are also five Pastas. 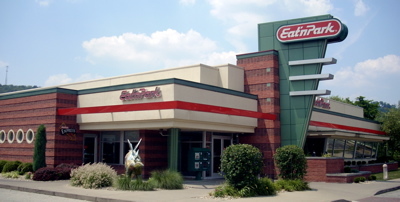 EatnPark (Waterfront) is Pittsburgh's version of Jerry's, Big Boy or Elby's. These are low cost family restaurants, but this is a very classy version. As you sit inside, you'd swear you were in an upscale, trendy, pricy establishment. The menu corrects that illusion. The excellent buffet -- soups, salads, breads, desserts--will fill you up, and there's a Friday-Saturday midnight buffet and a Saturday-Sunday breakfast buffet. From the seafood menu there's Sole, Cod, Scrod, or Salmon. They offer four Chicken entrees, three steaks, plus pork chops and liver & onions. The breakfast and lunch menu is extensive and the tea and latte column is pretty extensive. EatnPark specializes in Milkshakes, and you can order some pretty exotic flavors, such as Mocha Java or an Oregon Chai Tea Shake. If you really want to fuel up for a long hard day at Kennywood, try the Bananas Foster French Toast. If you stop for lunch on the way home, try one of their five Black Angus Burgers. The most expensive entree is $9. Uno, The Chicago Grill, seems at first glance to be a classic pizza and burger joint. Certainly, they offer some great pizzas and burgers. The Farmer's Market Pizza, Spinoccoli Pizza and Old Chicago Classic Pizza are the best of their deep dish menu, the Roast Eggplant Spinach Pizza and Spicy Shrimp Pizza lead the flatbread pizza list, and there's a Daily Pizza Special. Uno's offers three Paninis, eight classic sandwiches, plus calzones, sliders and seven salads in large or small sizes. But the big surprise comes when you flip over the menu and find three pages of full dinner entrees. There are eight pasta dishes, including their famous Rattlesnake Pasta, seven chicken dinners, led by Chicken Milanese, four steaks, seven fish items, ribs, and 15 appetizers. Red Robin specializes in gourmet burgers with plenty to satisfy other tastes. There is the Royal Red Robin, which tops off three strips of hickory smoked bacon, cheese, lettuce, and tomatoes with a fresh fried egg. The Mushroom Burger, BBQ Burger and Guacamole Bacon Burger are worth a try, but the fireworks come with the Alarm Burger (pepper jack cheese, jalapenos, tangy salsa, tomato, lettuce, chipotle), Monster Burger (two huge beef patties with the usual tomatoes, lettuce, onions, pickles and cheese), and Chili Cheeseburger (beef patty, chipotle, cheddar, and red onions buried in homemade chili). For the burger averse, there are soups, wraps, quesadillas, salads, fajitas and pastas. Ten very good beverages and three great desserts finish things off. Fuddrucker's doesn't lose its focus with anything else : it's a burger place and proud of it. Nor is it into gimmicks. They just do basic burgers better than anybody else. But they cover all the bases : a Three Cheese Burger, Inferno (jalapenos , pepper jack cheese and onions), Chipotle BBQ Burger, Swiss Melt Burger, Bacon Swiss Burger and Lone Star Chili Burger. Dieters get a Buffalo Burger, Turkey Burger and Veggie Burger. There are grilled or fried chicken burgers and a Rajun Cajun Spicy Chicken Burger. Five salads complement all these burgers and there's a full component of teas, milkshakes, sundaes, and floats. Damon's has positioned itself as a classic sandwich stop, although it does have a solid menu of full entrees. The star of the show is the Steamboat, a loaf of that fresh hearth baked bread filled with tender pork drowned in barbecue sauce and topped with two kinds of cheese. Then there's the Southern Barbecue Pulled Pork Sandwich, Prime Rib Sandwich, and Buffalo Chicken Sandwich. Hoagies include the Aztec Chicken Hoagie (fire roasted chicken smothered in pepper jack cheese), Bistro Turkey Hoagie and Mushroom Jack Brisket Hoagie. Add to this six salads, a soup of the day, five fish dinners, two rib orders, four chicken dishes and three steaks. Longhorn Steak House (interior shown top right) is a very good steak restaurant with very reasonable prices. The four dinners they're famous for are Flo's Filet (7 oz. hand seasoned), Porterhouse (22 oz. New York strip chargrilled), Outlaw Ribeye (18 oz. hand rubbed and grilled over an open flame), and The Big Sky Bleu (9 oz. topped with melted bleu cheese, then served atop a bed of red wine glazed portabello mushrooms). If none of these appeal to you, there are 10 others. The best of the appetizers are the Shrimp - Lobster Chowder and Texas Onion (large onion petals lightly battered, fried and served with a dipping sauce). There are four salads, ribs, salmon, shrimp, lobster, and Honey Mustard Chicken. Desserts include Key Lime Pie and Fried Cheesecake. Bring your camera; the Longhorn is right below the 12 chimneys, a dramatic sight. P. F. Chang's is in the middle of the Waterfront complex, with a block of retail stores between it and the Marriott. This is Corporate Chinese, but it's very good. It offers a Cantonese menu with a few Sichuan items. We like the Moo Goo Gai Pan, Ginger Steamed Salmon, and Sea Bass marinated in spinach soy sauce. On the vegetarian side, the Eggplant And Scallions stir fried in chili pepper sauce is memorable. If you like Sushi, try a Cantonese version : Ahi Tuna rolled in Chinese spices, wok seared and served cold with spicy mustard. The Pin Rice Noodle Soup is outstanding. Menu items are designed to be shared. Decor is very classy. 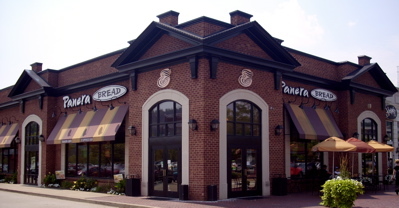 Panera's is across the street from P. F. Chang's, also in the middle of the Waterfront complex. It began as a bakery specializing in gourmet breads, evolved to a breakfast spot, and has become a great place for lunch or a light snack anytime. There are various kinds of bagels, croissants, rolls, muffins, scones, baguettes and pastries. We're especially fond of their sourdough bagels. They offer 10 signature sandwiches. You can even order three kinds of boxed lunches, each including a sandwich, salad and cookie. Five salads, soups, and the usual upscale teas, coffees, cappucinos, frappacinos and juices round out the menu. There are tables indoors and out on the patio. We're most impressed with the Asiogo Roast Beef Sandwich, Mediterranean Veggie Sandwich, and Smoked Turkey on Sourdough. For breakfast, we think the Assorted Seasonal Fruit Bowl is their best offering, although it's intended to serve several, so is far too much for just one person. All of these other menu items should not obscure the fact that their bread is still the best in town. Rock Bottom is a beer lover's fantasy. They take pride in having a certified brewmaster on premises and winning over 100 awards for their various brews. They urge you to ask the waiter to recommend the perfect beer to match whatever food you order. They offer light lagers, wheats, pale, amber, brown and dark ales, and other specialized flavors. Faced with this lineup, the food has to go some to be noticed. They've got six salads, 10 appetizers, 10 sandwiches, four burgers, three pastas, four pizzas, nine entrees, and six desserts. And they use their alcohol in their best items. We like the Bourbon Barbequed Salmon, Stout Basted Ribs, and Stout Onion Soup, Jamabalaya With Red Ale Rice, Bourbonzolaburger, Stout Cheesecake, and the Stout Hot Fudge Sundae. For teetotalers, the Flank Steak Chili, Angus Beef Meatloaf, and Smoked Chicken Enchiladas are the best of the rest. Among the appetizers, the Brown Ale Brushed Ball Park Pretzels and Asiago Dip With Beer Bread stand out. Designate a driver. 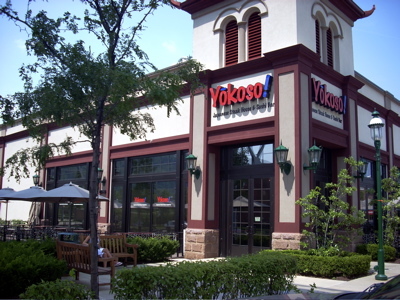 Yokoso's is a Japanese steak house and sushi bar in the center of the Waterfront complex. It is very popular so if you plan to drop in for dinner on a Friday or Saturday reservations would be a good idea. Yokoso's is proud of its policy of using no MSG; it cooks with olive oil and vegetable oil. The extensive Sushi Bar menu includes 84 items, of which the Dynamite Salmon Roll and the Alaskan (smoked salmon, asparagus, avocado and flying fish eggs) are the individual highlights, and the Sashimi Platter (tuna, salmon, whitefish, shrimp, crab and yellow tail) and Vegetable Sushi Medley (asparagus, avocado, tofu skin, and cucumber roll) are the best of the dinners. The Seaweed Salad and Green Onion Soup are great sides. Over on the dinner menu, everything comes with Japanese Green Onion Soup, House Salad, Shrimp Appetizer, Hibachi Vegetables and Fried Rice. We like the Scallops, but the Hibachi Chicken, Twin Salmon, and Vegetable Delight are fine alternatives. There's a five item children's menu and 11 combination dinners, mixing and matching chicken, steak, salmon, scallops, lobster and shrimp. One of the more unusual items you might overlook is tucked over there among the side orders. It's the Tempura Udon (thick noodles in a hot broth with seaweed and shrimp). Try it as an appetizer if nothing else. 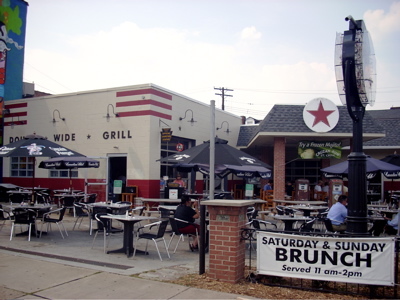 If you're arriving or departing around lunch, you really should stop at The Double Wide Grill on Carson Street. It will be one of your wackiest eating experiences. The Double Wide is a gas station converted to a restaurant. The outside still looks like the old gas station, but inside they've built the bar around the base of the hoist and left most of the tools and equipment hanging on the walls and a green pickup up on the hoist(see top right). They're only open 11-3. Some of the items are just fun, like the Hubcap Potatoes (hand breaded garlic and herb seasoned red potatoes served on a hubcap), Build Your Own TV Dinner, or 7 Up Pancakes. But don't let it fool you. There's some serious cooking here. The Crab Black Bean & Corn Fritters, Brie & Spinach Stuffed Portabello, Avocado Sandwich, Portabello Reuben, Beef Chile Omolette, Rebel Yell Jalapeno, and Tilapia Taco are very creative, unique and delicious. If weather permits, you really need to sit outside and soak up the Carson Street ambience, this being one of the great streets of Pittsburgh and America, every bit the equal of the French Quarter, Greenwich Village or the Riverwalk. 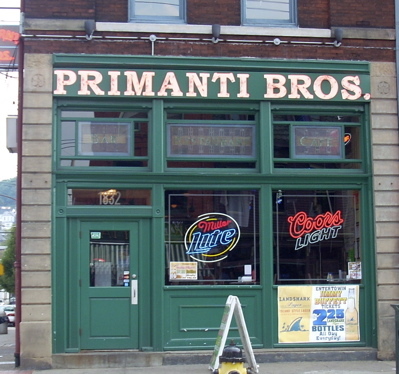 Primanti Brothers is on your left halfway up Carson Street. It's not a big place but it doesn't need to be. It is one of the city's most famous restaurants and they only serve one thing : a sandwich that has come to be called The Primanti. 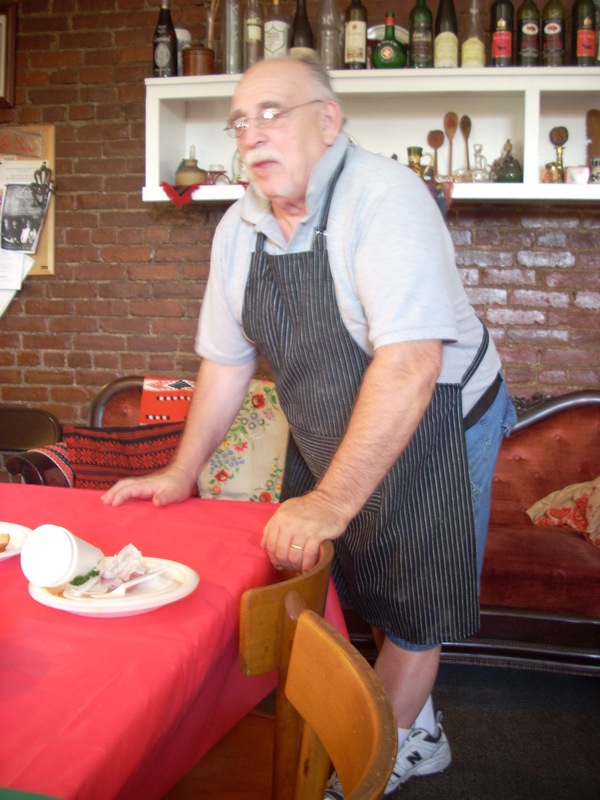 Joe Primanti and his brothers started the business in 1933 with a wooden lunch stand serving produce workers and truck drivers over in the Strip District across the river. Now there are 16 locations around the city and The Primanti is recognized as an American Culinary Classic by the James Beard Foundation. The famous sandwich recipe is grilled meat, fried potatoes, sliced tomato, coleslaw and provolone cheese between two thick pieces of Italian bread. There are a few options, such as onion or fried egg, but most fans take their Primanti straight. Any deviation and it's not a Primanti. No rye bread, no wheat bread, no other cheese, no lettuce. And the fan base is huge. The Food Channel, Travel Channel and ESPN drop by when they're in town. Native Pittsburghers now living elsewhere drop by for their once a year Primanti when they come home for a visit. Tourists drop by. Kennywood fans consider Primanti's as much a part of their annual visit as the Jackrabbit or Noah's Ark. Even KW staffers frequent the place. Nakama is Pittsburgh's most famous Japanese steak house and sushi bar. Located halfway up Carson Street, it has been named not only the best Asian restaurant in town, but the best overall restaurant, by the Post Gazette, Pittsburgh Magazine, and even several airline magazines. The Sushi Bar features the Spider Roll (soft shell crab, avocado, cucumber, kaiware and crabstick) and Hanelai (eel, crab, avocado, cream cheese and tobika). We're not huge sushi fans, but these two items are the best sushi we've ever tasted. Among the appetizers, we like the Onion Soup, Squid Salad, Seaweed Salad, and Tai Maki Rolls (two crispy rolls filled with vegetables and served with duck sauce). Our favorite dinners are the Seafood Combination (lobster, shrimp, scallops), Hibachi Scallops, and Seafood Diablo (shrimp and scallops over udon noodles). Nakama offers six fine steak and three chicken entrees, plus a column of combination dinners, mixing and matching steak, chicken, scallops, shrimp and tuna. It is easy for this menu to focus attention entirely on the food, but in truth, Nakama's is as much about entertainment as about the taste buds. The chefs who perform at your table, fixing your meal right in front of you, are at least half the total experience. Their flamboyance and dexterity with all those knives and flames are worth the visit. 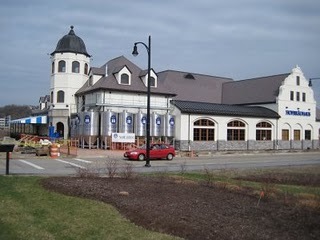 Hofbrauhaus is on the river, two blocks from Joseph Beth Bookstore. Expect a wait to sit inside, but you can walk through to the riverfront patio. Hofbrauhaus was founded in 1589 in Germany as a royal beer hall and opened to the public in 1828. In 1937 John F. Kennedy was caught trying to smuggle out one of their famous mugs. If you're a beer conneisseur this is The Place, but the food's great, too. Among appetizers, the Soft Dough Pretzels, Fried Pickles, Potato Pancakes and Sauerkraut Balls are the best, although the Southside Combo is almost a meal in itself with four cheeses, cold cuts, basil, tomatoes and chive bread. Hungarian Goulash is a MUST. This is one of Pittsburgh's greatest items. Order only the small bowl. The large is a meal in itself. Entrees are a German lover's Paradise : Mettwurst, Bierwurst, Sauer braten, Schnitzel, Bratwurst and Kasseler Rippchen. We especially recommend the Wurstlteller, a sampler of three wursts with sauerkraut and potatoes. For a couple or party of three there is the Schmankerlplatte, a Bavarian Sampler Plate of schweinbraten, smoked pork chops, three wursts, sauerkraut, fried cabbage and potatoes. There's Oktoberfest Schweinshaxe, a slow roasted pork shank with crackling, sauerkraut and bread dumpling. Classic sides start with red apple kraut, sptazle with cheese or haxen sauce, and German potato salad. Apfel Strudel is the Dessert de Rigeur, but there's Black Forest Chocolate Cake or Windbeutel. If your idea of a big night out is Pizza, you don't need to drive very far. Just cross the bridge and go to Ambridge. 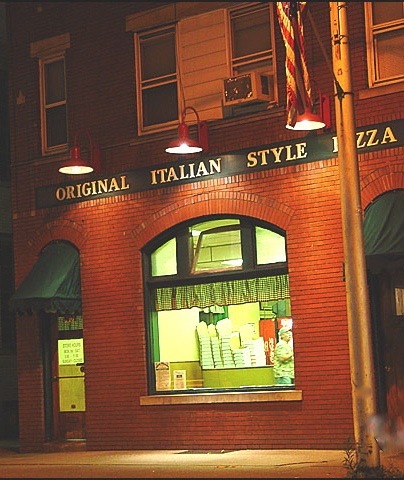 The best Pizza in Pennsylvania is available at The Pizza House, which everybody in three states calls Police Station Pizza because it's in the old police station. It's a carry out only operation but people drive in from all over Western Pennsylvania to get it. This is Original Sicilian, Square Cut, Thin Crust, Medium Sauce Pizza. They bake it right in front of you to your specificiations. You can also get it to take home and bake yourself, or you can buy their famous homemade sauce. Friday and Saturday nights you'll see crowds and lines, but they're pretty efficient and you'll get served fairly fast. Please email your photographs to Coraopolis60@aol.com. We especially need photos of the Friday Night Club, various scenes at the YMCA such as pool, pingpong, swimming, weight lifting and the gym; junior high football, basketball and cheerleading; classroom scenes in elementary or junior high; students' cars; school holiday decorations such as Christmas trees; and field trips. We need photos with recognizable faces. Do not send original photos by mail; they are too valuable and it is too risky.